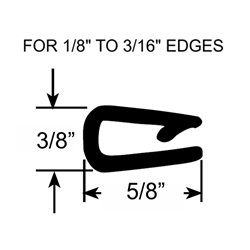 Flexible vinyl metal core fits unfinished edges between 1/8" to 3/16". Single inner lip helps to adhere rubber to surfaces. This part can be used on any edge where a rubber finish is needed. Ideal for egress, sun-roof and vent hatches. Longer legs create a deeper channel for edgings with a greater height.